For books 6 7/8" tall and up to 15" long (width of front and back cover + width of spine). The width of the clear cover is adjustable. 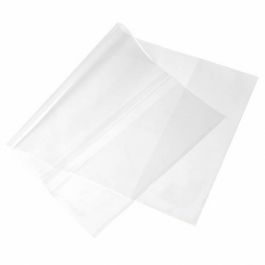 This thinner, 2.0 mil crystal clear book sleeve offers more affordable protection than a thicker, vinyl sleeve. These thin, 2.0 mil, book sleeves provide protection at a more affordable cost than traditional thick vinyl covers. 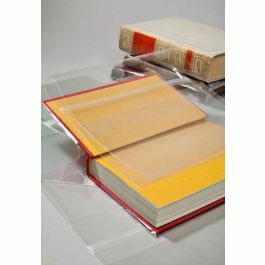 These disposable book covers are made of crystal clear polypropylene rather than dense vinyl. Ideal for retail packaging, gallery environments, and personal collections. The width of the clear cover is adjustable to fit multiple book thicknesses. Our lightweight covers work as a barrier against greasy fingers, dust, pen marks, dirt, and grime. They are best used in a setting where books are exposed to light wear, such as a book signing or a personal collection. Uses: protect retail books, gallery and exhibit books, school books, and personal collections. Dimensions: 7 1/8" x 15"